If young children enjoy reading with a parent as much as playing games and other activities, they are more likely to develop into successful, life-long readers. Make reading with your child one of the most enjoyable times of the day. Snuggle up and enjoy a book with your child every day. It is also important for your child to see you and all members of your family reading for pleasure. Show your child how important reading is in your life and talk about how much you enjoy reading. Children who love reading rely on books as much as they do toys for learning and fun. They act out their favorite stories with puppets and props, they ask to be read to throughout the day, they are excited during shared reading time and they ask to visit the Library. Good readers also "read" or recite favorite books to adults. September is Library Card Sign-Up Month. Go to the Library and sign up your child for "My First Library Card." Pick up a copy of the fall youth program brochure. Talk about the concept of "days" and "months." Count the number of days in September. Count the number of months in the calendar. Look at the date in September 2014 that your child starts kindergarten. Explain that you are going to count down the days until kindergarten begins. Read five books from the "Counting" booklist. Make a tally mark for each book you read. Help your child mark important dates on the calendar: birthdays, family vacations, holidays and other events. Count household items that are relevant to learning. Count objects such as shoes, socks, stairs, doors or windows. 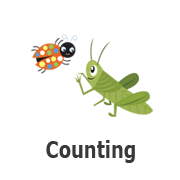 Finding relevant items to count around your house is great practice with number recognition, but also oral language, memory, number association and basic math skills. Preschoolers are learning ordinal numbers and identifying which object is first, second and last. Recall a book you recently read, and talk about what happened first, second and last. You can also recall a recent trip or outing. This is great for memory building, math and oral language skills.